Q: According to reports, after the Canadian government arrested Ms. Meng Wanzhou, the chief financial officer of Huawei, the spokesperson of the Chinese Embassy in Canada has issued a statement about this. Can you tell us whether the Chinese side has summoned the Canadian Ambassador to lodge representations in Beijing? A: The Chinese side has lodged stern representations with and made clear its solemn position to the Canadian side and the US side respectively on this matter, demanding them to immediately clarify the reason for the detention and release the detainee, and earnestly protect the legal and legitimate rights and interests of the person involved. Q: Whether the detention of Meng Wanzhou, the chief financial officer of Huawei, might affect the ongoing trade negotiations between China and the US? 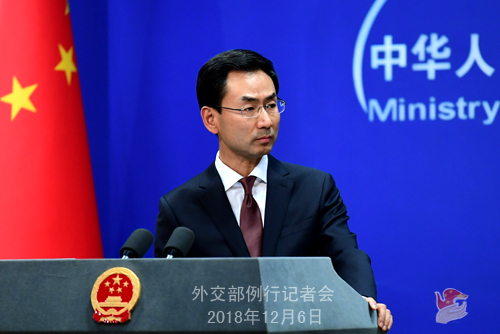 A: Like I said just now, the Chinese side has made clear its stern position to the Canadian side and the US side respectively on this matter, demanding them to immediately clarify the reason for the detention and release the detainee, and earnestly protect the legal and legitimate rights and interests of the person involved. With regard to the trade talks between China and the US mentioned by you, I have kept stressing in the past few days that China and the US should follow the consensus reached by the two heads of state to step up consultations and reach a mutually beneficial agreement at an early date. Q: Regarding the detention of Huawei's chief financial officer, when was the Chinese side notified of that? It is learned that she was detained on December 1, the day when the China-US leaders' meeting was held. Did the two sides talk about this during the meeting? A: On your first question, I cannot talk about the specifics of this case here. What I can tell you is that after learning about the relevant situation, the Chinese side immediately provided consular assistance to the person concerned and lodged stern representations with the Canadian side and the US side, demanding them to immediately clarify the reason for the detention and release the detainee, and earnestly protect the legal and legitimate rights and interests of the person involved. 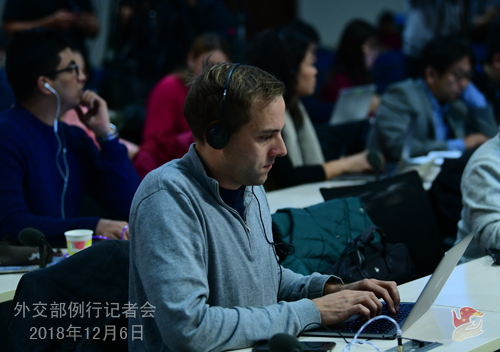 On your second question, both China and the US have issued the readouts on the China-US summit. I may refer you to that. Q: Sources familiar with the situation say that the Chinese intelligence services are suspected of involvement in the hacking of the US hotel group Marriot. Do you have any comment on this? A: I am not aware of the situation you mentioned. China firmly opposes all forms of cyber attack and cracks down on it in accordance with the law. If offered evidence, the relevant Chinese departments will carry out investigations according to the law. We firmly object to making groundless accusations on the issue of cyber security. We all know that cyber security is a global issue that bears on the shared interests of all countries. China is one of the major victims of threats to cyber security including cyber hacking. But China is also a staunch supporter of cyber security and has been in close cooperation with all sides on combating cyber crimes. We maintain that the international community should engage in dialogue and cooperation to address cyber security threats and uphold shared interests on the basis of mutual respect, equality and mutual benefit. Q: Such corporate executives as Meng Wanzhou could be found guilty in Canada for being in breach of sanctions the US has imposed on Iran. What is your comment? A: As a permanent member of the UN Security Council, China has been faithfully and strictly implementing all the resolutions adopted by the Security Council. Meanwhile, we oppose the imposition of unilateral sanctions by certain country outside the framework of the Security Council. This position is consistent and clear-cut. In addition, according to my information, Huawei has issued a statement on this, which stressed that it abides by all the applicable laws and regulations of the countries where it operates. I would refer you to that. Q: The spokesperson of the Chinese Embassy in Canada in his statement said that Meng Wanzhou had not violated any Canadian or American law. Can you tell us what the basis of that statement is? A: Like I said just now, the Chinese side has made clear its stern position to the Canadian side and the US side respectively on this case, demanding them to immediately clarify the reason for the detention and release the detainee, and earnestly protect the legal and legitimate rights and interests of the person involved. Meanwhile, I believe you have also noted that Huawei has issued a statement on this. I may refer you to that. Q: The Chinese side has not actually got a full explanation from the Canadian side as to why Meng Wanzhou was detained. Is that right? 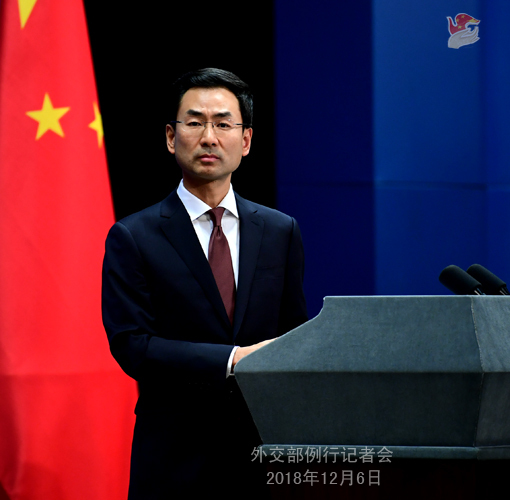 A: The Chinese side has lodged stern representations with and made clear its stern position to the Canadian side and the US side respectively on this matter, demanding them to immediately clarify the reason for the detention and release the detainee. According to my information, neither the US nor Canada has made any clarification on the reason for the detention so far. Q: Does China view this case as a legal and criminal matter or a political matter? Q: The Chinese Embassy in Canada said that the detention of Meng Wanzhou had seriously harmed her human rights, but the Canadian side said that she was detained under Canadian law. Why did the Chinese side say that her detention seriously harmed her human rights? A: According to my information, the Chinese Consulate-General in Vancouver immediately provided consular assistance to the person concerned. The Chinese side demands the Canadian side to earnestly ensure Chinese citizens' security, humanitarian treatment and legal rights and interests. Detaining the person involved without providing explicit reason certainly harms her human rights. In addition, like I said just now, neither the US nor Canada has made any clarification on the reason for the detention so far. Q: President Xi Jinping has just concluded his state visit to Portugal, during which the Chinese and Portuguese leaders witnessed the signing of the MOU between the two governments on jointly building the Belt and Road Initiative. Could you offer more information on that? A: Portugal is an important link connecting the overland and maritime passages of the Silk Road, presenting natural advantages to the Belt and Road cooperation between China and Portugal. Portugal has been actively supporting and participating in the Belt and Road Initiative. The signing of the MOU between the two countries on jointly advancing the Belt and Road Initiative signals that new steps have been taken by the two sides to move forward cooperation under the Belt and Road framework. This will deliver tangible benefits to the two countries and peoples. China will hold the second Belt and Road Forum for International Cooperation in Beijing in April 2019. During this visit, President Xi Jinping extended his invitation to Portuguese President Marcelo Rebelo de Sousa to attend the forum and pay a state visit to China. President Rebelo de Sousa gladly accepted this invitation. Now with the signing of the MOU, China and Portugal will strengthen synergy between respective development strategies, expand bilateral trade and two-way investment, continuously optimize and upgrade bilateral cooperation, jointly explore third markets, and forge new growth drivers for cooperation so that more practical outcomes could be achieved in China and Portugal's joint efforts to advance the Belt and Road Initiative and strong vitality will be injected into the China-Portugal Comprehensive Strategic Partnership. Meanwhile, we will seek to further align the Belt and Road Initiative with the EU's Eurasian connectivity strategy to drive forward cooperation between Asian and European countries and break new grounds for the regional and world economic growth. Q: According to reports, on December 5, delegations from the Yemeni government and the Houthis arrived in Sweden. Peace talks are expected to start very soon, which would be the first face-to-face talks between the two warring parties in Yemen since 2015. What is your comment? A: China welcomes the peace talks in Sweden on the Yemen issue and commends the positive efforts made by Martin Griffiths, Special Envoy of the UN Secretary-General for Yemen and other relevant parties. We hope that all parties in Yemen could prioritize the interests of their nation and people, seize the "window of opportunity" they have now, engage in dialogues in a practical and candid way, and create favorable atmosphere and conditions to restore peace, stability and order in Yemen at an early date. Q: Some media reports have suggested that Meng Wanzhou holds a Canadian as well as a Chinese passport. Can you confirm whether she entered Canada on a Chinese passport? Will that affect the way she is treated as part of the consular case? A: Like I said just now, I cannot talk about the specifics of this case here. Q: Has DPRK Foreign Minister Ri Yong-ho arrived in Beijing? Will he meet with President Xi Jinping? A: As far as I know, foreign Minister Ri Yong-ho's activities in China are mainly scheduled for tomorrow. Relevant press readouts will be released by the Chinese side after the activities. Please keep following his visit to China.